Hey, blog-world! It’s been awhile…just wanted to let you know I haven’t forgotten about you. 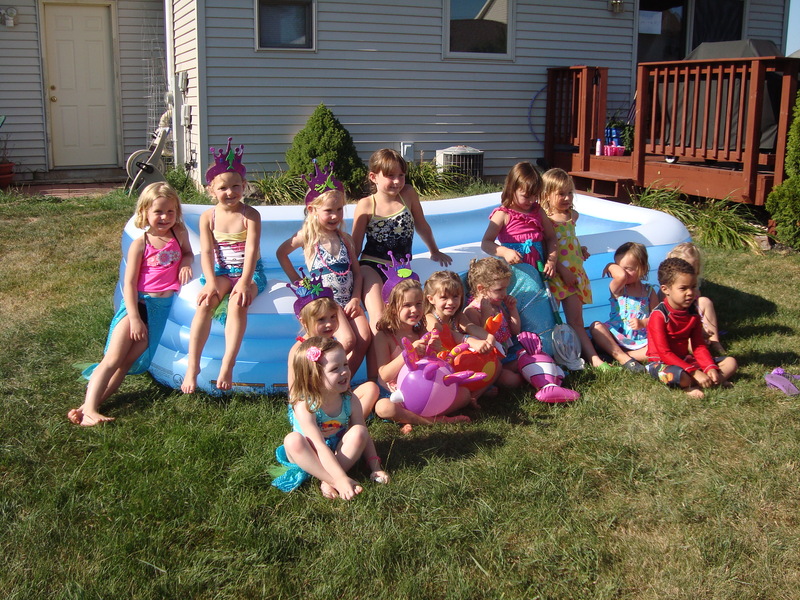 It’s just this pesky “space capacity” thing that wordpress has; not letting me add any more photos of the littles and such. So, I’ve decided it’s time to move on. 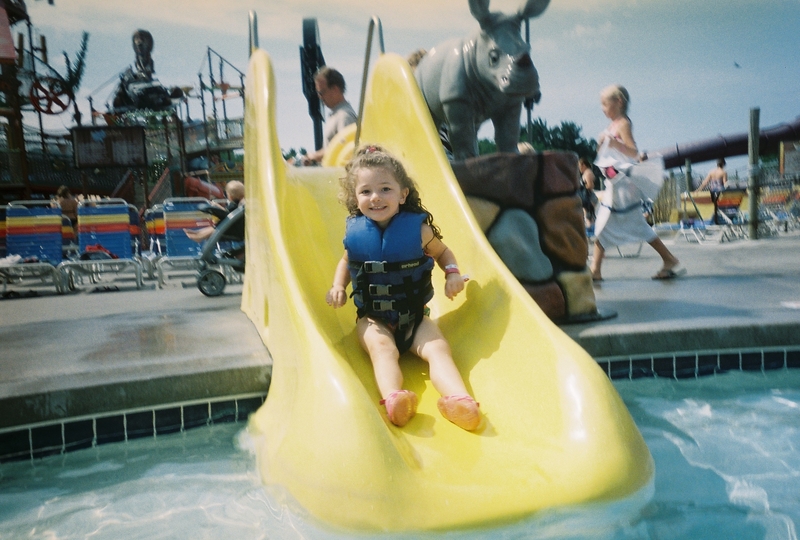 New blog with LOTS of upload space for all those adorb photos of my kids (yes, you WILL look at them!) and a new title to go with it. 12. Who is your best friend? Alyse, Isla and a girl she met at the park (once). These questions were asked on June 26, 2012. S is 4 years old. 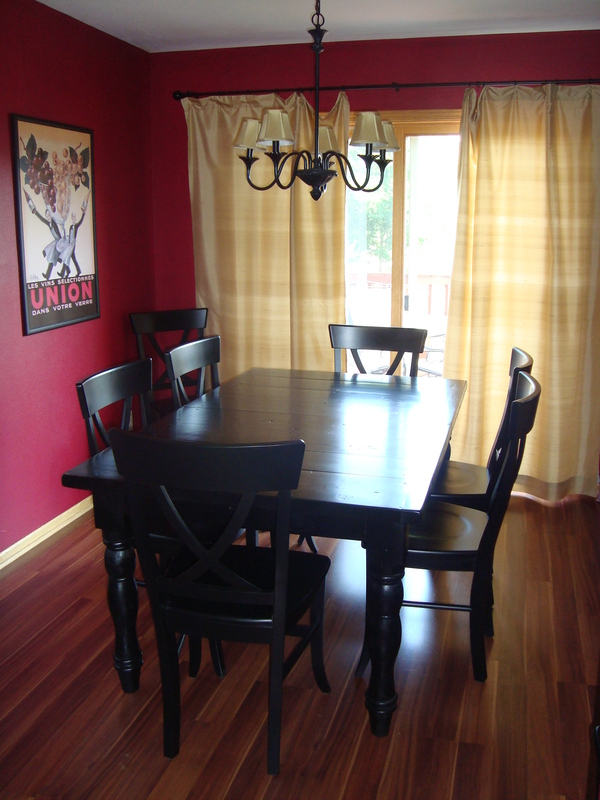 You’d be surprised how hard it is to find a black dining table. I mean, a SOLID black dining table. Most of the tables at Pottery Barn, Crate and Barrel and the like feature black tables but they are distressed. No offense to the country-style-lovin’ folk, but I have enough stress in my life…I don’t need to add to it with rough edges on my black furniture. 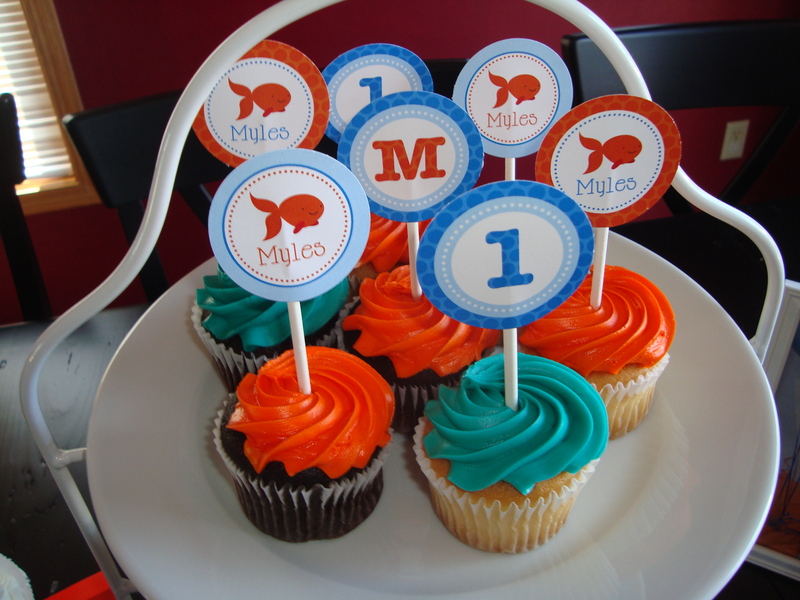 For M’s 1st Birthday, I decided to go with a goldfish theme. 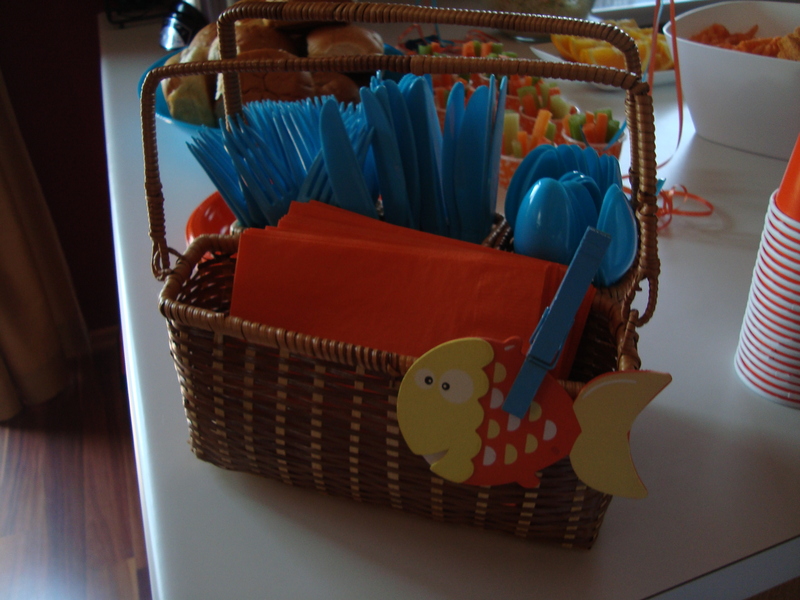 Goldfish are cute and so is M. Honestly, I have no idea why I landed on that idea, but when it came to me, I just went with it, as many of my creative geniuses go…there really wasn’t much to do for this par-tay, as it was just close family and no little guests to entertain. 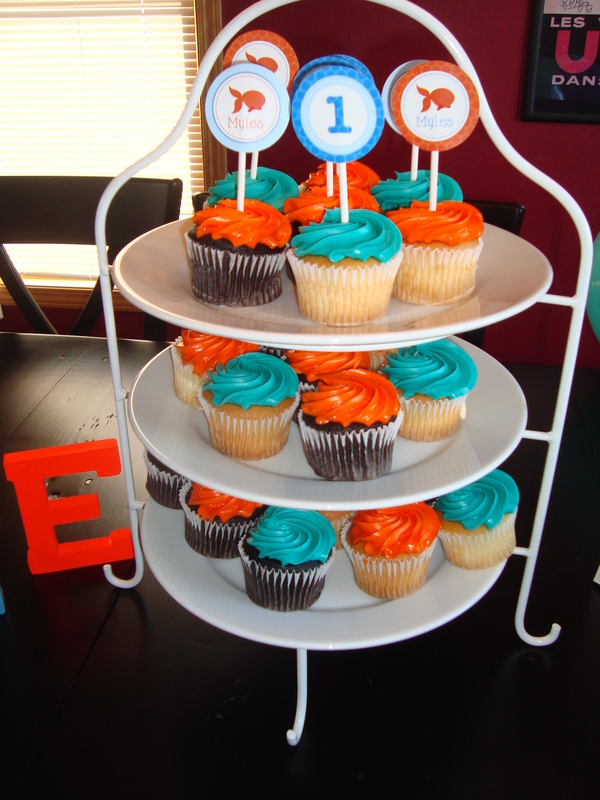 After I found a cute 1st birthday hat, goldfish shirt and some invites on etsy, I pretty much did the rest myself…making the high chair design out of different color ribbon tied on some twine. We took M’s smash cake pics early at JCP so we’d have them to display at the party (and they made my thank-you’s already!). 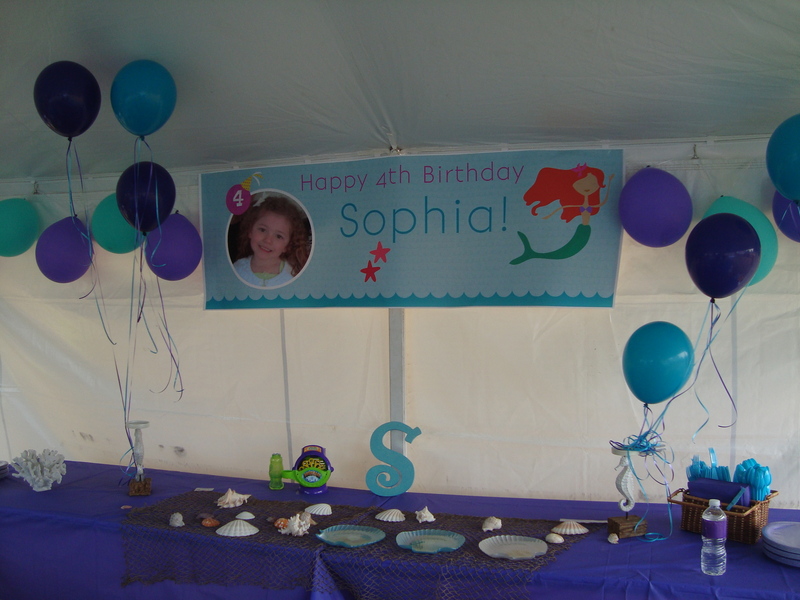 I also found this cute banner at Kara’s Party Supply and added some pics of M as he grew to each pennant. 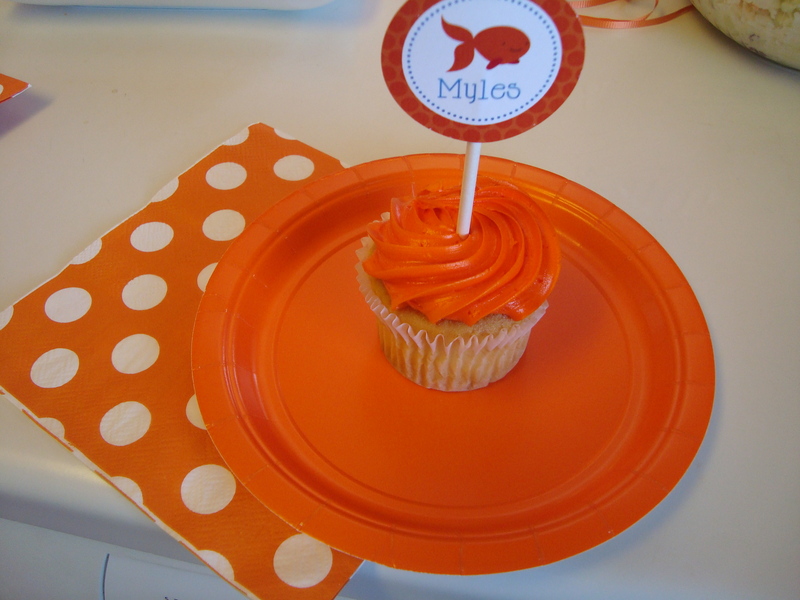 The food theme was anything “orange”. 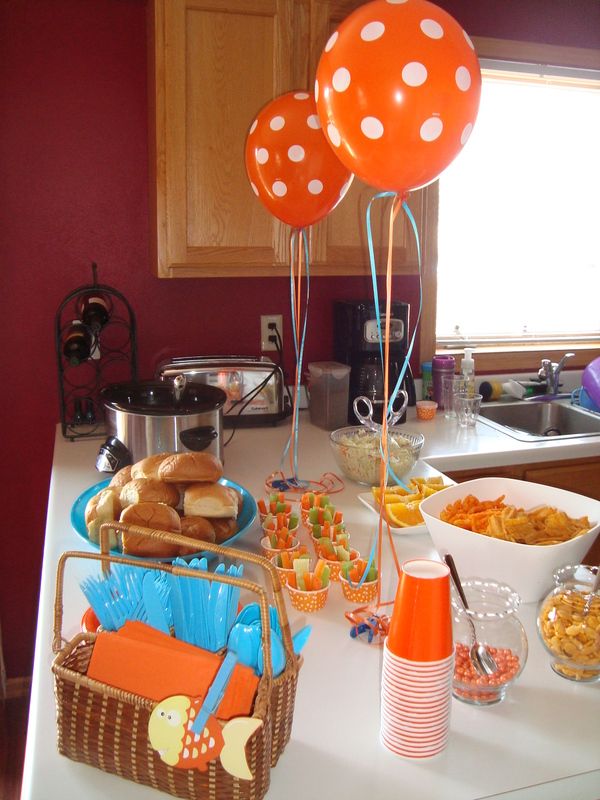 I served pulled pork sandwiches with wheat and white buns, cole slaw, orange slices, carrot and celery cups w/ ranch dressing, cheetos and sun chips, goldfish crackers and sixlet candy. 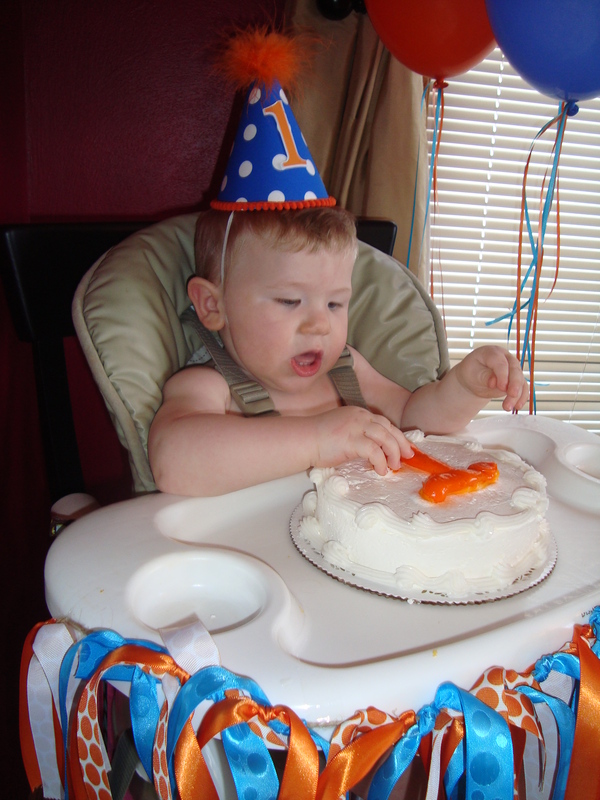 For dessert, M got to dig into his smash cake (courtesy of Craigs Cake Shop) as the rest of us ate some orange and blue cupcakes. 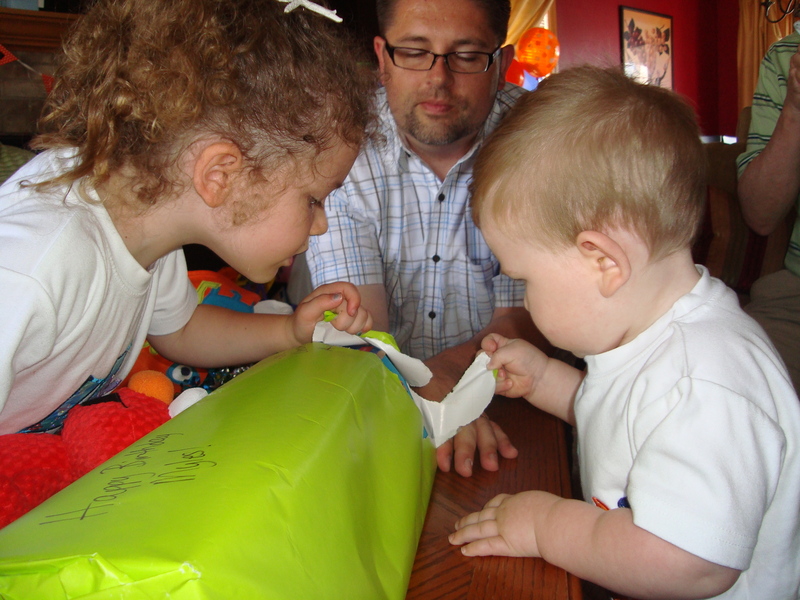 M had fun opening his gifts. 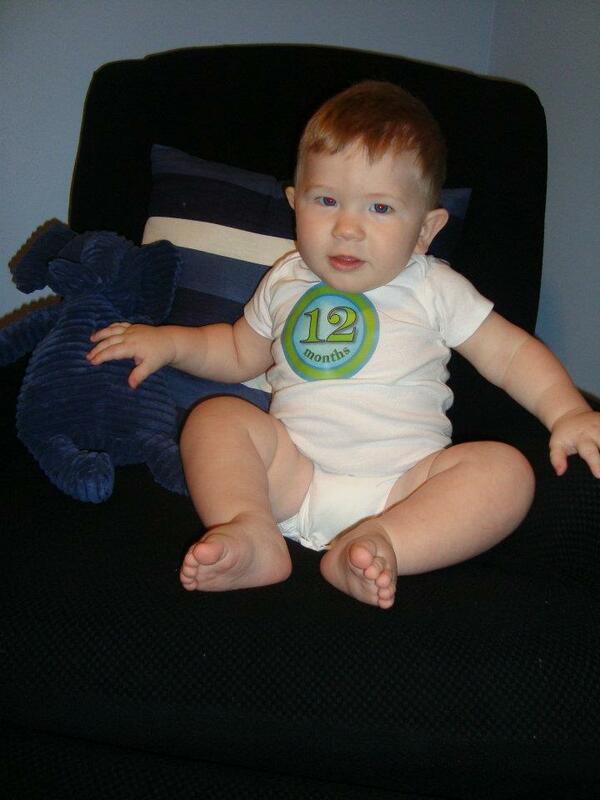 Can’t believe he is 1 year old already! 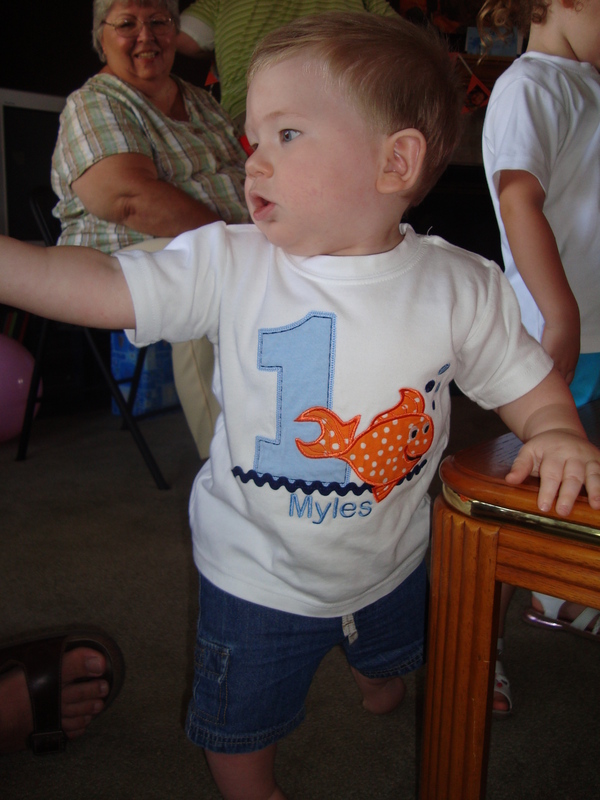 Happy 1st Birthday, Myles! Hope you had fun! We love you so much! Starfish hairpin from a seller on etsy. 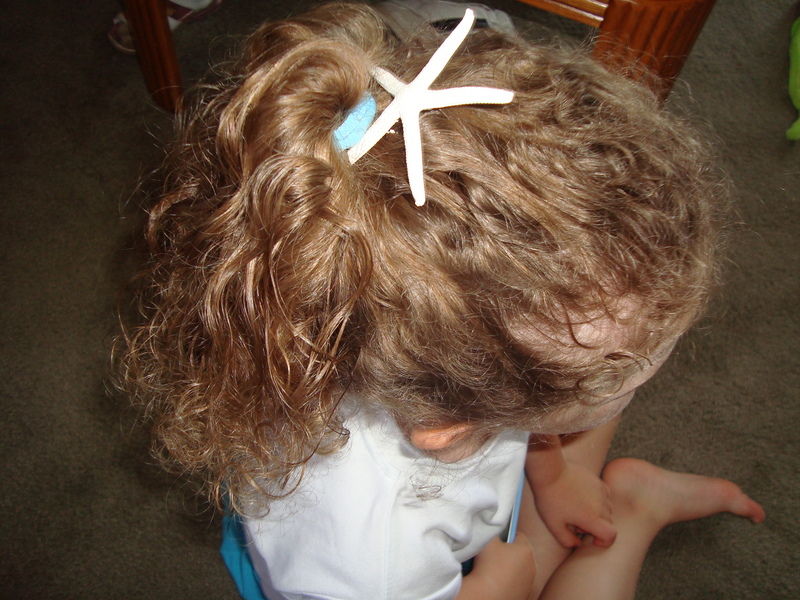 I had one too, but it broke off the pin before I could even use it, so I just stuck the end of the starfish in my hair and it worked well. 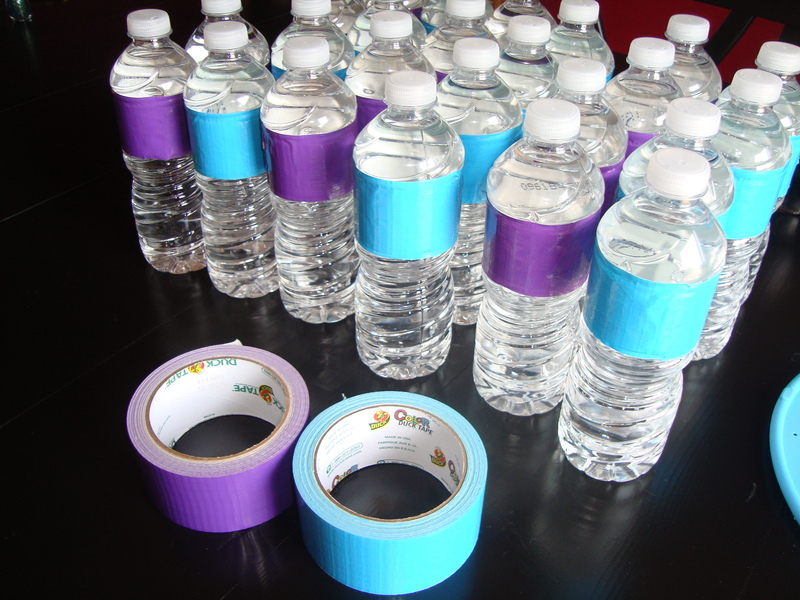 Duct tape on the water bottles to match the color scheme. 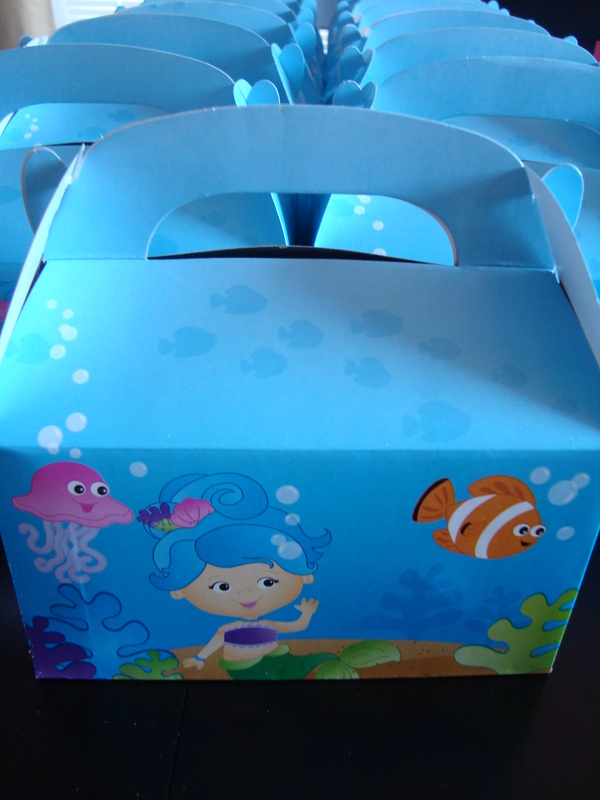 Favor boxes (amazon.com) with Rock Candy, Salt Water Taffy (Kara’s Party Shoppe) and bubbles. 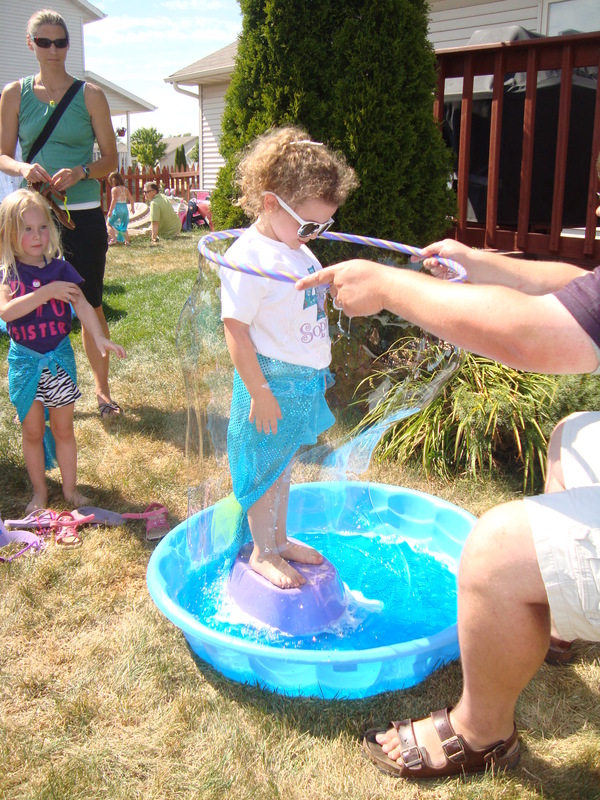 Mermaid in a bubble activity. 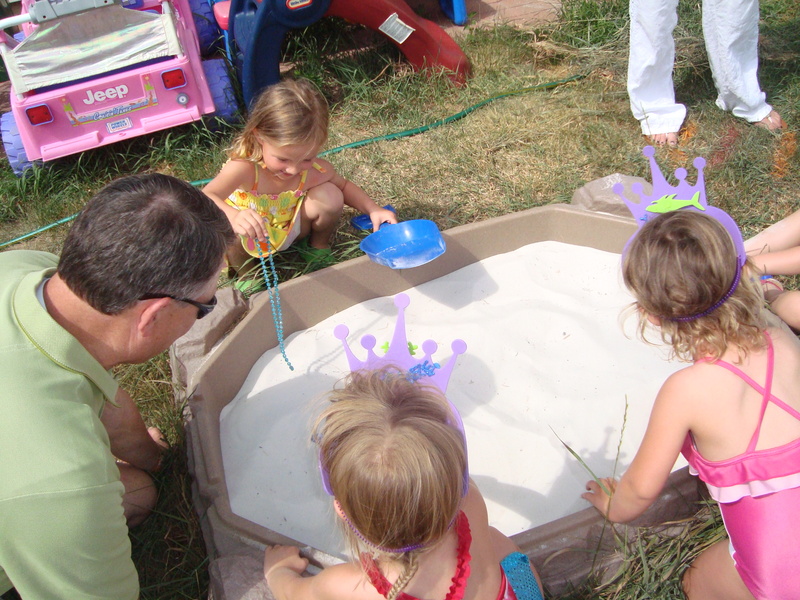 Buried treasure dig. Love my dad for getting into it with the girls and helping out! Ring toss game. Floaty animals from Party City. 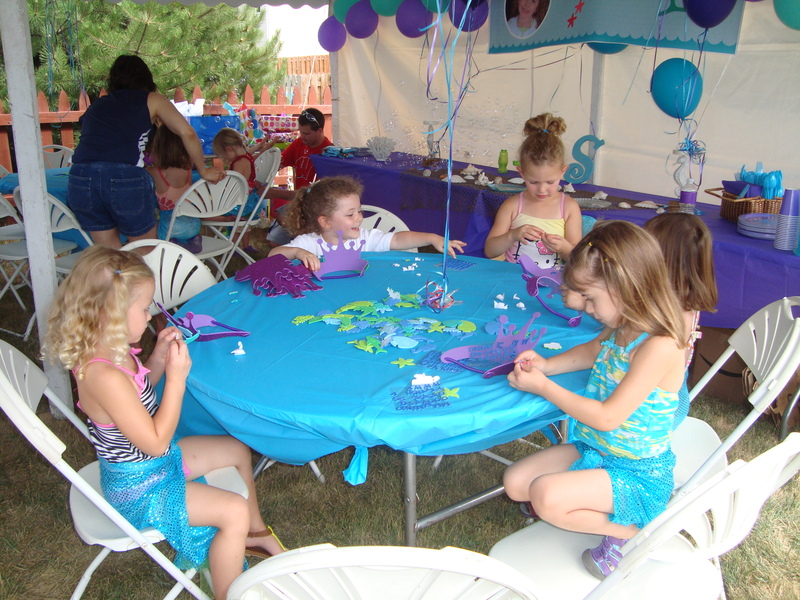 Girls making their crowns. 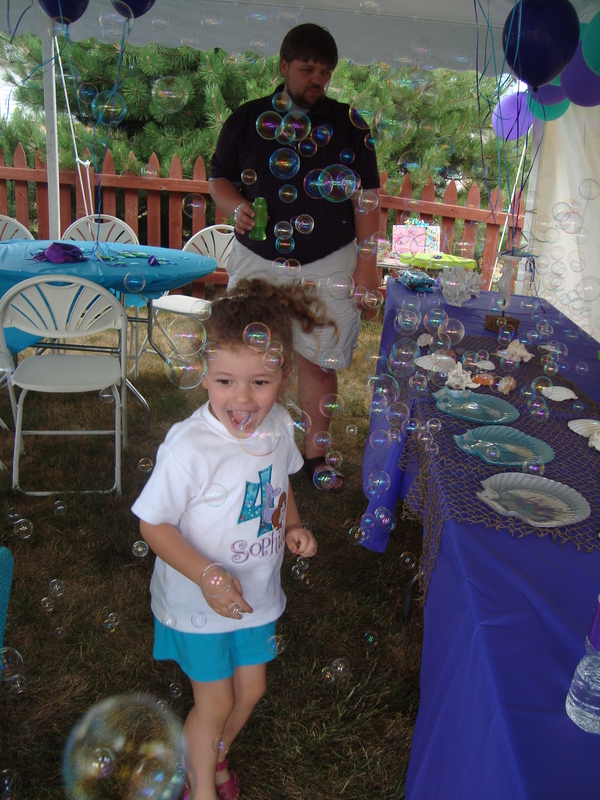 Bubble machine was a hit! 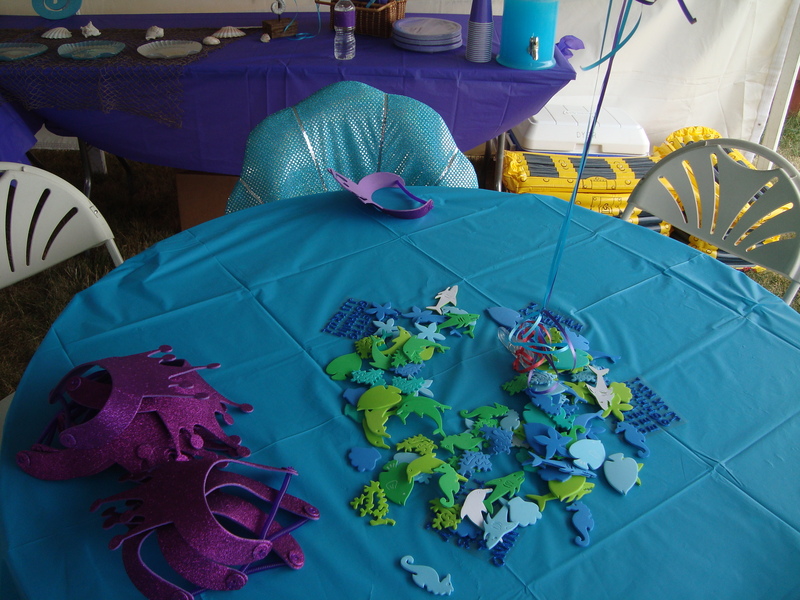 I didn’t get a shot of all the food (and I also didn’t have time to make labels for all the food like I had planned), but we served octopus hotdogs, peanut butter and jellyfish sandwiches, mermaid juice (kool-aid), seashell pasta salad and fruit salad (which was supposed to be starfish fruit salad, but apparently it is not starfruit season). 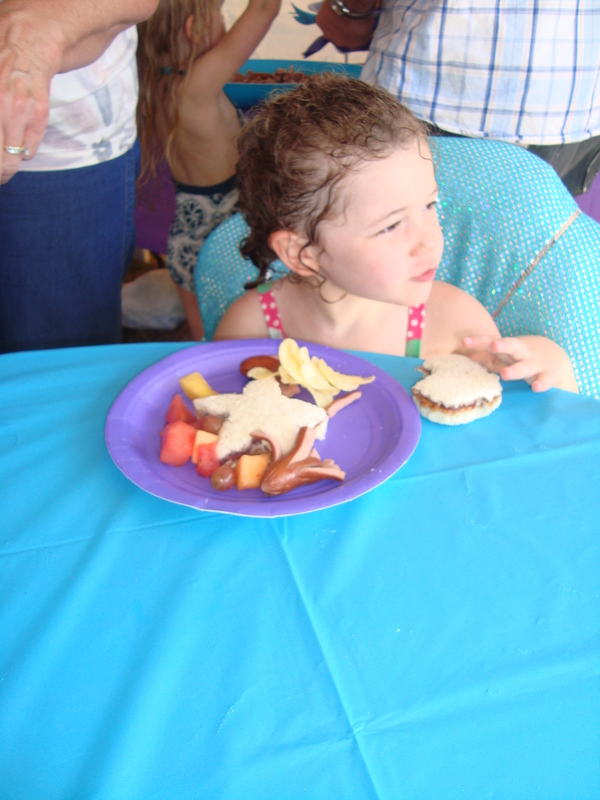 I also had submarine sandwiches for the adults. 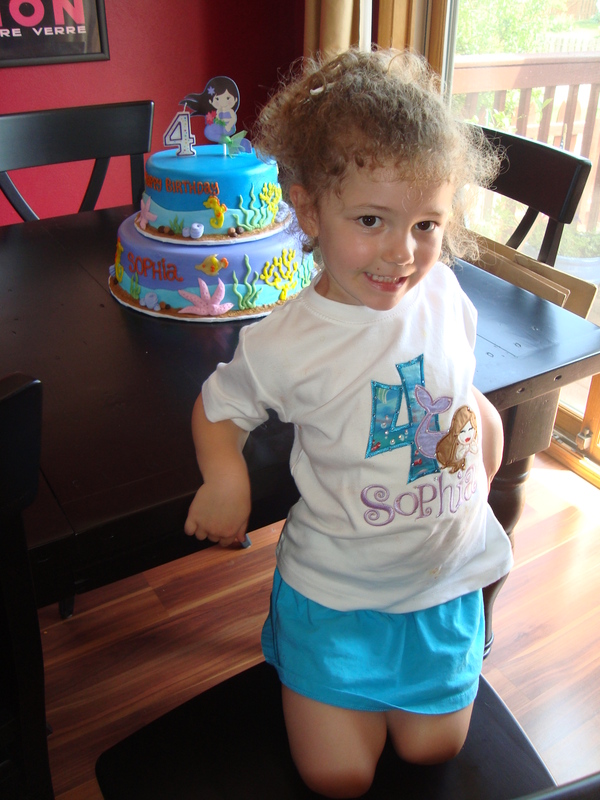 S posing with her mermaid cake and her birthday shirt (etsy). 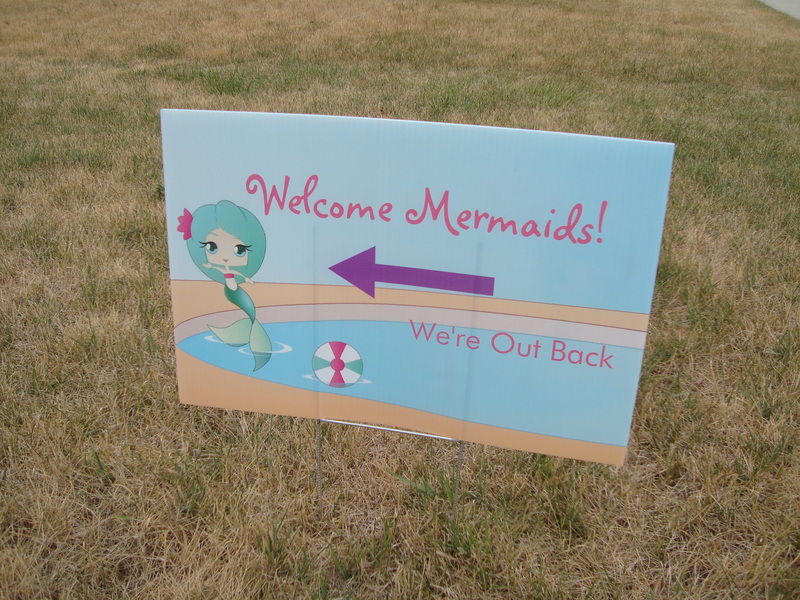 It was so much fun to plan this event for S. I know she and her little mermaid friends had lots of fun. I definitely couldn’t have pulled this off without the help of J and his bro and SIL and my parents. They were my set-up and demolition crew and so much help in between! 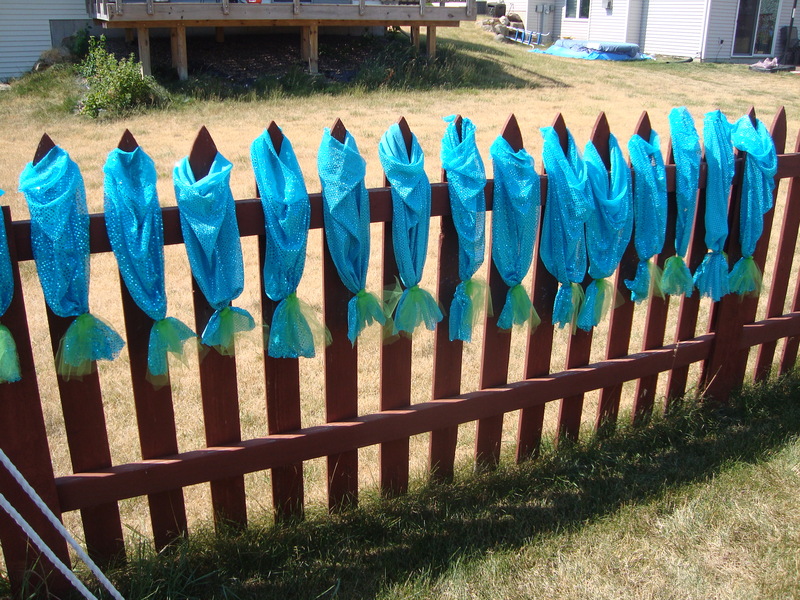 It was a lot of work, but lots of fun, too. 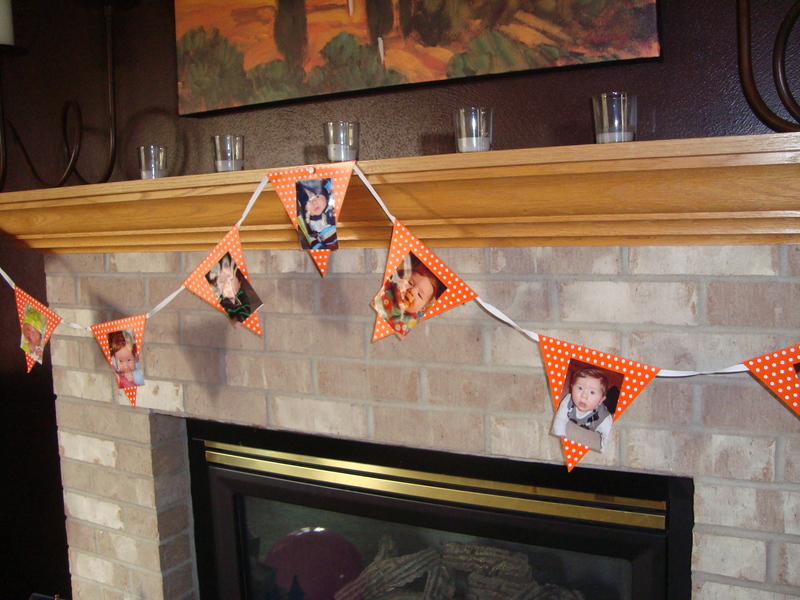 I joked off and on during the day that next year it’s going to be a Chuck E Cheese party…but I kind of doubt that once I get back on pinterest and start thinking about the next party! 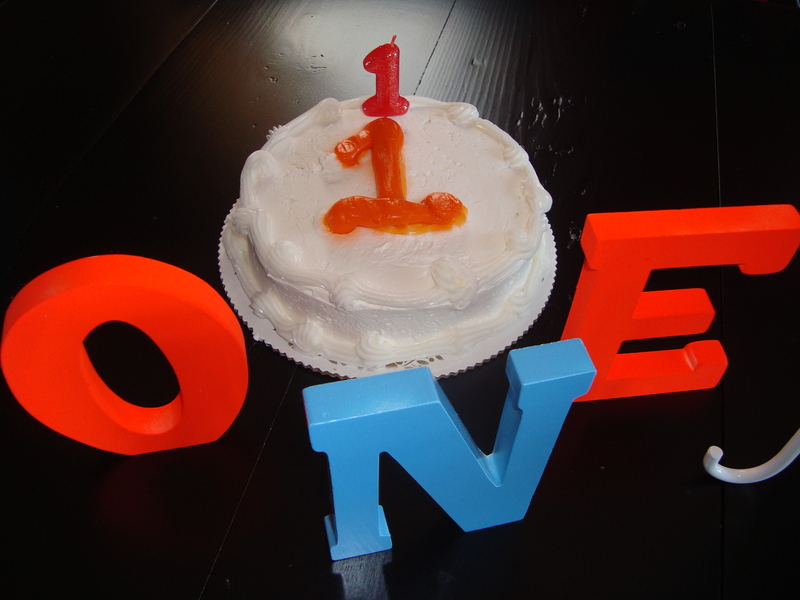 Well, look who’s ONE! 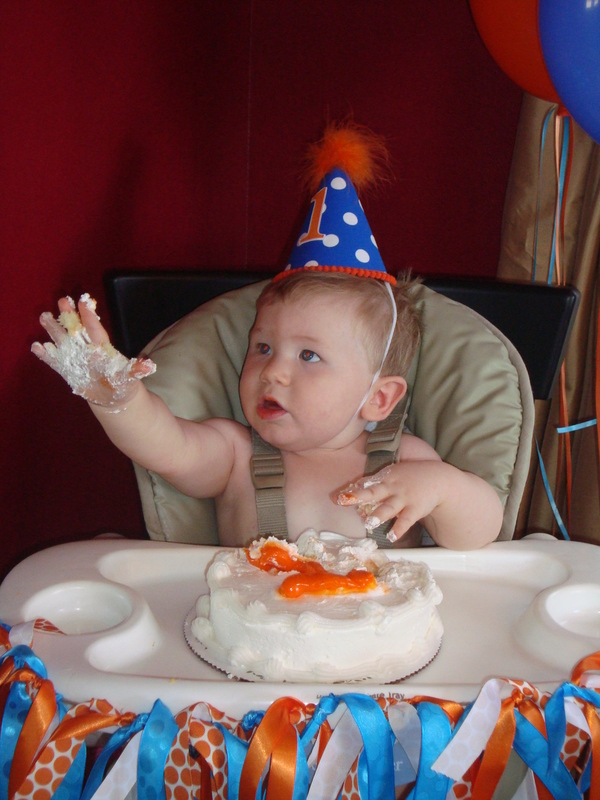 Myles made it through his first year of life (and his parents lived to tell about it…). What a year it has been, one that flew by so fast I’m so glad I took pictures to prove it actually happened. M is all boy. A phrase that frequently comes out of my mouth as I watch him play and interact with his world, “He’s such a boy.” Bangs on things, investigates how everything works, shows no fear in getting what he wants…his latest trick scares the you-know-what out of me. On occasion, he will just be sitting there and then all of a sudden decide to throw himself backwards and lay flat on the floor. He does this on the bed, which is a bit safer, but still scary since he could throw himself off the bed, on the floor, wherever he happens to be. Such a goofball. Speaking of goofball, he loves to ham it up with big sis. They are going to be quite the pair, those two. I’m just thankful they get along so well. I know that might not always be the case, but for now, the Sophia/Myles duo is getting along quite well. Now that he’s learned to scale the stairs going up, his new thing is learning how to go back down. I know he’s said “mama” a few times now (has had “dada” down pat for awhile) and mimics my intonation when I say “all done!” He can sign for “more”…which he does a lot. This kid is seriously the world’s best eater. (knock on wood) Whatever I put in front of him, he eats…and since I like my food to have lots of flavor, he’s had the opportunity to sample a lot of adult-fare, he’s our little gourmand! He’s 26 lbs and 29 1/2 inches. 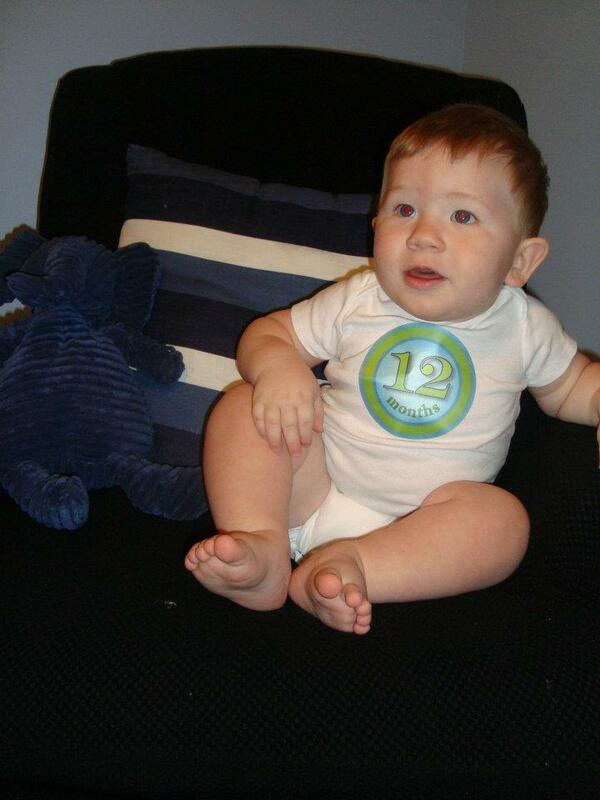 We’re moving into size 4 dipes and 18 month sized clothes for our big guy. No go on the walking front just yet. He can balance by himself and will take one or two steps forward, but then decides to move to the floor and crawl to his final destination. I thought for sure he’d be walking by his first birthday! All in due time, I guess. Speaking of time, this momma is basically running out of it. 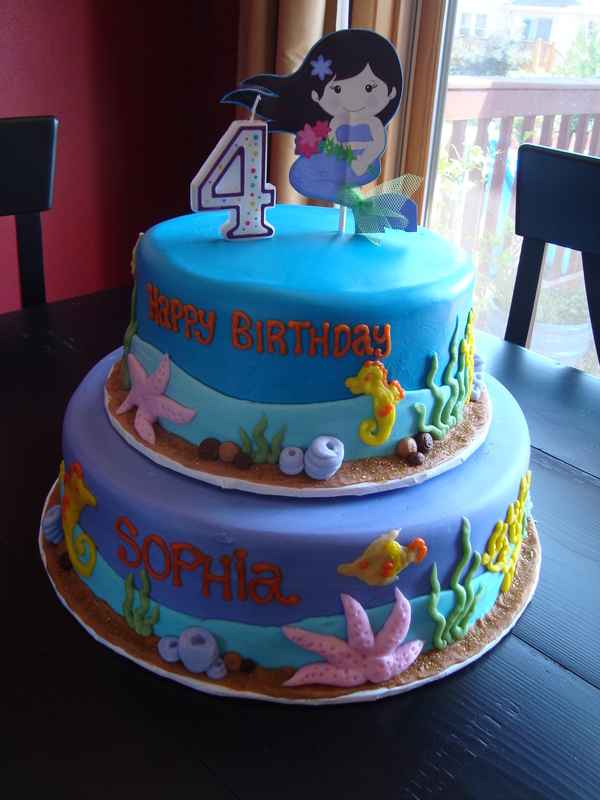 Being with the kiddos doing my solo full-time act, is leaving me with little time in my day to finalize birthday bash plans for M and his big sister. 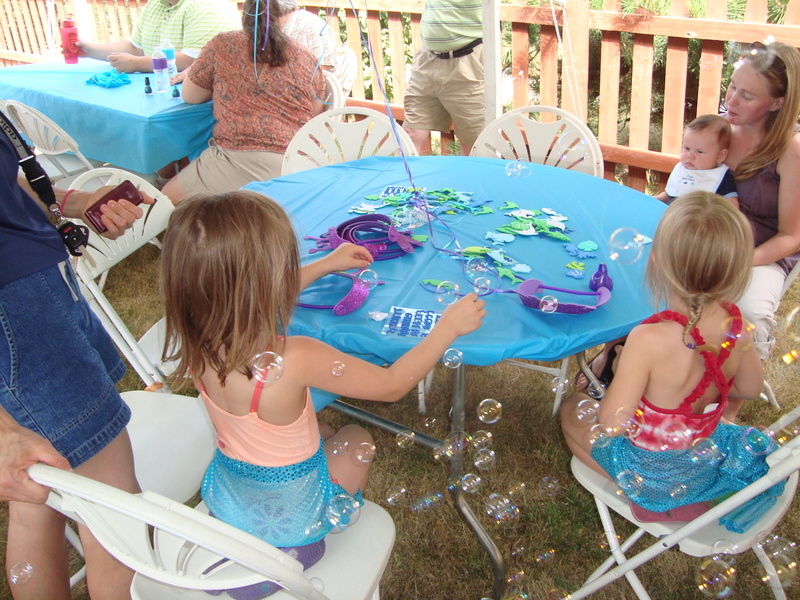 The parties are coming up fast, but going to be a blast. Thanks for making our hearts a little bit bigger this past year, Myles. 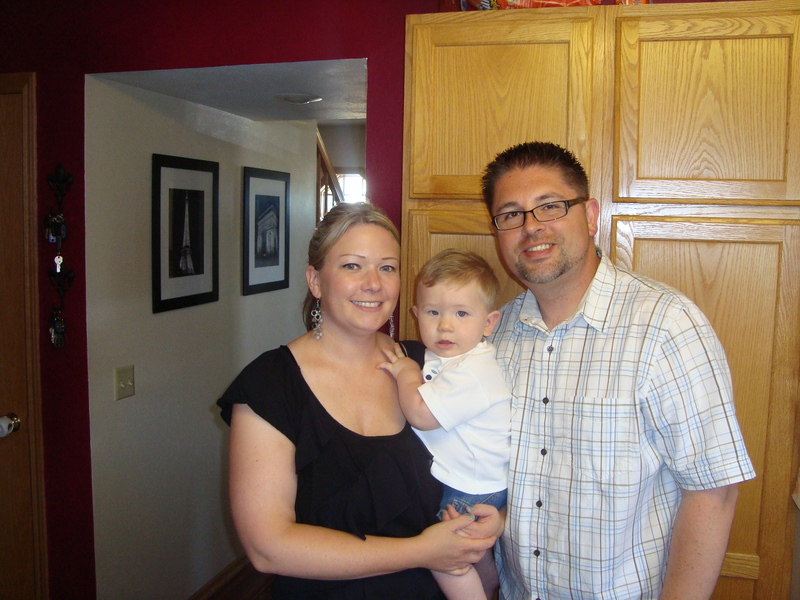 We love you so much and are so proud that you are our son. 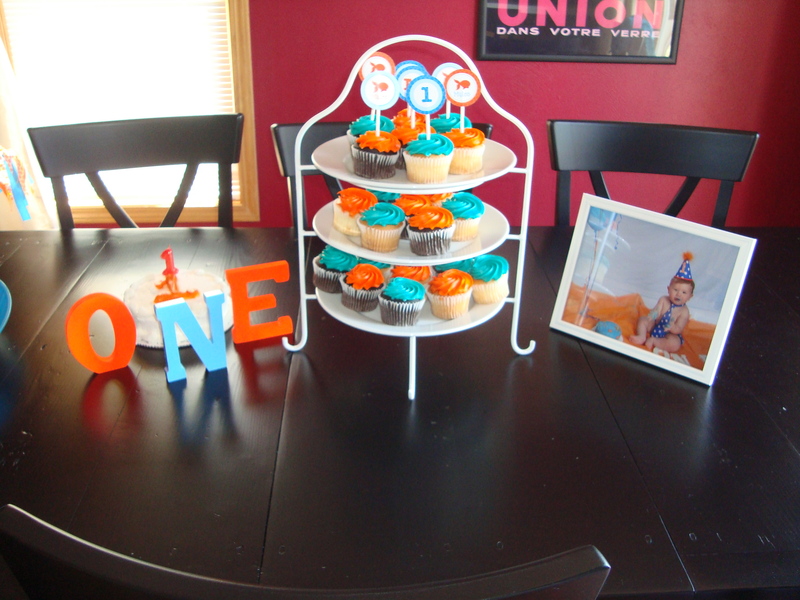 Happy 1st Birthday! This past weekend we spent the day with Thomas. Not just any Thomas, mind you, THE Thomas. You know, the TRAIN? As I expected, S had entirely too much fun meeting the real, live Thomas and his trusty pal, Sir Topham Hatt. I wasn’t even aware of this event until my dad told me about it. And he found out about it because his company has the honor of hauling Mr. Thomas all around the country this summer as he makes his appearances at railroad museums. 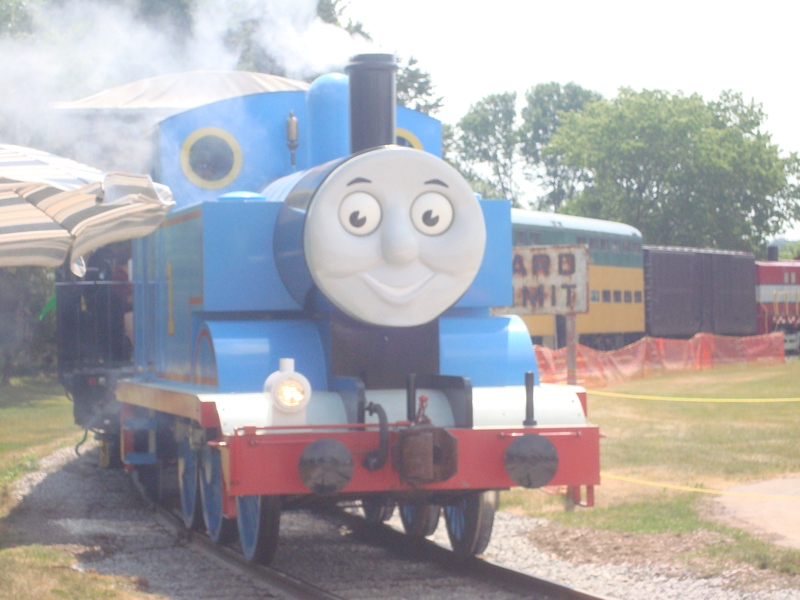 I even found out that they require that Thomas be loaded on the trailer backwards so that his eyes are facing out and can greet little ones along the road! How fun! 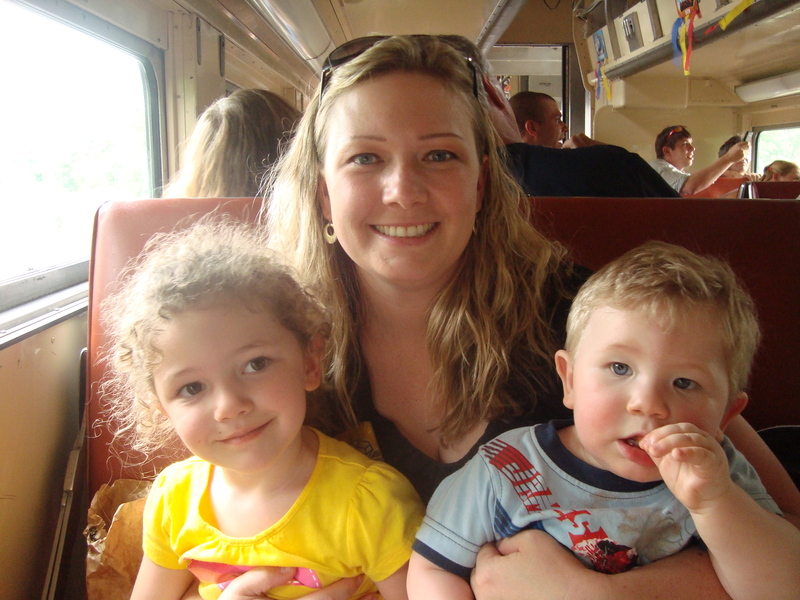 Anyway, back to the day…there was so much to see and do and the 25 minute train ride was a great finale to the day. There was a Thomas storytime/book reading area, model train demonstrations, magic shows, a meet and greet with Sir Topham Hatt, temporary tattoos, an arts and crafts area…and that was just the indoors activities (nice and air-conditioned, too!). Outside there was a bounce house and a slide, a sandbox and jungle gym area, a hay bale maze, gift shop, food tent, and a nursing/diaper changing area. 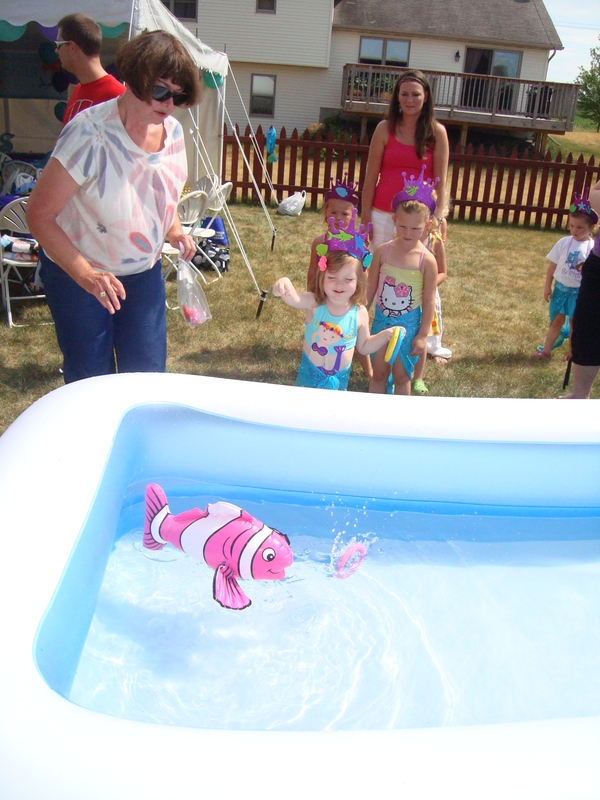 It was definitely geared for the little ones and staffed by very helpful volunteers. We were so impressed by how organized everything was. It was very well done. They even had photographers set up at the key locations to take your group photos, which you could look up later online or view in the gift shop….which reminds me, I still need to look ours up online. 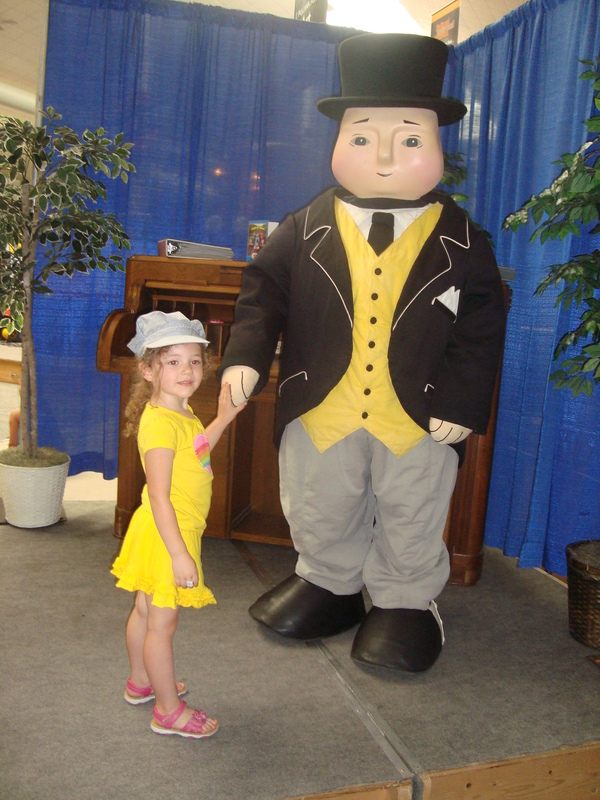 S was elated to meet Sir Topham Hatt and was not afraid of her first real “character” experience. She went right up and held his hand. And when we got there, Thomas was making his rounds around the track and she was yelling and waving like he was her best friend. You have to purchase your ticket for a certain boarding time. Ours was 12:15. If I had to do it again (and we likely will next year), I’d get a slightly earlier time for the train and get there earlier for the activities. Everyone was getting tuckered out by lunch time. 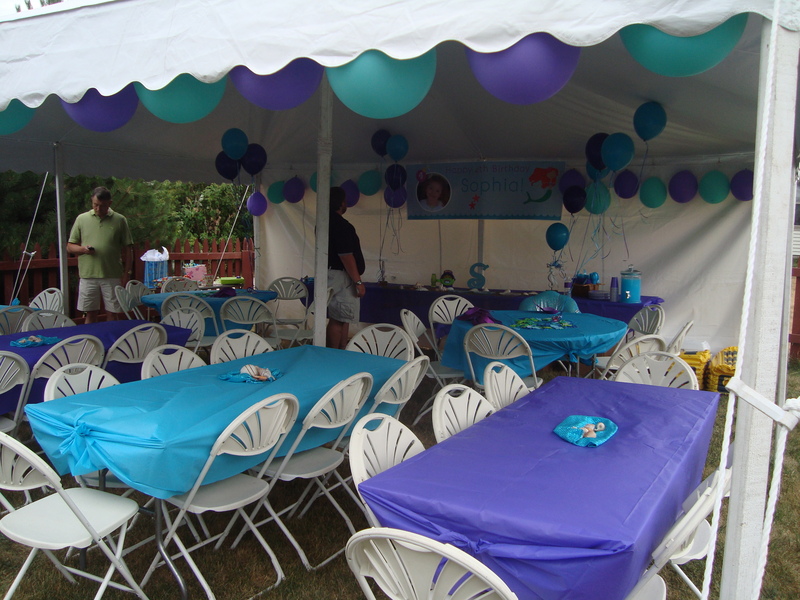 Plenty of restrooms and room for strollers, definitely a very family friendly event. It was so fun to see S so excited about meeting him. She was pretty tired when we got back to the car (kids were both asleep by the time we rolled out of the parking lot), but she said, “I want to come back tomorrow!” Oh, and parking…there’s a shuttle that you can take in, but we just parked across the street next to the school and walked the two blocks in to the museum. Easy peasy! 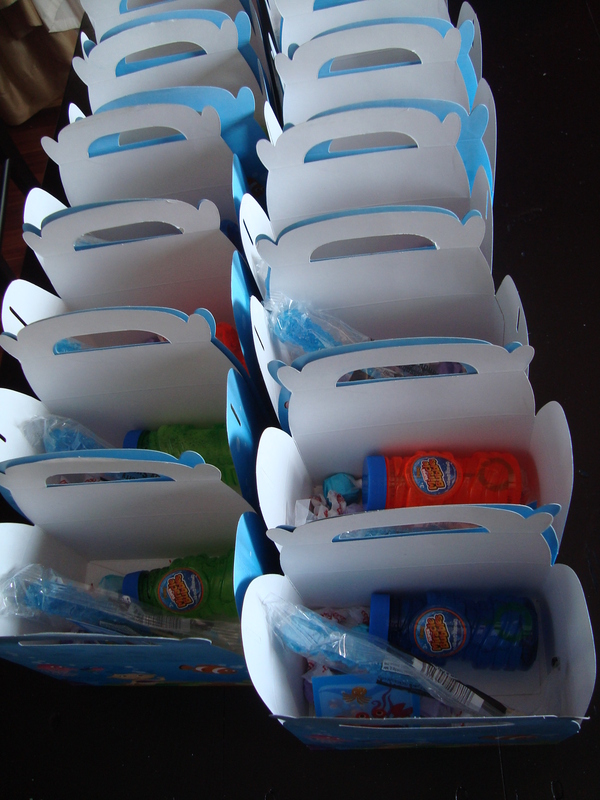 Since September 2009, I've saved $2,787.13 just by clipping coupons!